Competitive pricing: We offer excellent value for money and significant discounts for large organisation purchases. Management Reporting: Our easy to use management dashboard will enable your management team to quickly see when each member of their team is due to revalidate and how much of their portfolio they have completed, making it easy to ensure that everyone is on track. Quick set up: All we need is your staff’s names and email addresses to enable them to start using their Portfolio. 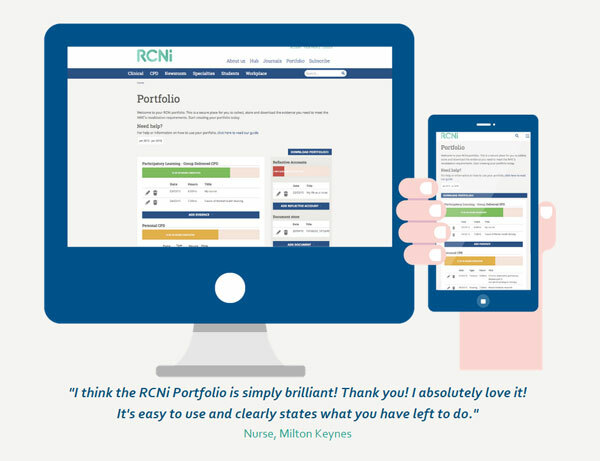 Simple: The RCNi Portfolio tool is much more intuitive and simple to use than some other tools out there. Trusted: RCNi is part of the Royal College of Nursing Group. All our products have the RCN ‘seal of approval’, including the RCNi Portfolio, ensuring you are provided with a tool of the highest quality, which promotes best practice. Unrivalled CPD content: Our flagship publication, Nursing Standard, is Europe’s best-selling nursing journal. By purchasing the RCNi Portfolio, you will be giving your nurses access to a handpicked selection of the high quality CPD articles we are known for. Please complete the fields below to download your brochure. It contains additional information about organisational access to RCNi Portfolio to help you make an informed decision, including screen shots of just how easy the tool is to use. We may use information collected to provide you with additional information about RCNi Portfolio. However we will never give, sell or rent your email address to any third parties. If you've got any questions or would like to request a quote, get in touch today and one of our friendly, knowledgeable team will be happy to help.